As grim observances for America’s notorious shooting massacres come and go, CNN’s Fareed Zakaria explores mental health and guns, the Second Amendment, mass shootings, and the politics and policies of guns in America and around the world for a special edition of Fareed Zakaria GPS. The one-hour Sunday morning special, Global Lessons on Guns – A Fareed Zakaria GPS Special, will air Nov. 25 at 10:00am and 1:00pm EST on CNN/U.S., and at 10:00am and 3:00pm on CNN Worldwide. Global Lessons on Guns examines how the tens of thousands of gun homicides and gun suicides reported by U.S. government agencies have propelled America to rank among the most violent of rich countries, in terms of gun deaths. To understand how this happened, Zakaria interviews author and CNN chief legal analyst Jeffrey Toobin, and the president of New York University’s Brennan Center for Justice, Michael Waldman, about what U.S. Constitutional framers intended for the Second Amendment, and the complicated politics of guns and gun policies in America. For a broad understanding of how mental health may impact gun violence in America, Zakaria interviews CNN chief medical correspondent and neurosurgeon Dr. Sanjay Gupta, MD and the vice chair of community psychiatry at the University of California-Davis, Amy Barnhorst, MD. Dr. Gupta and Dr. Barnhorst discuss the limitations of so-called ‘red flag laws,’ that are intended to regulate gun sales to people deemed to be at extreme risk for gun violence towards themselves or others. Zakaria also examines violent crime in Japan, revisits the legacies of mass shooting events in America and Australia, and takes viewers to Switzerland and Israel, to discuss gun ownership, gun safety, and a broad array of gun policies of other nations. 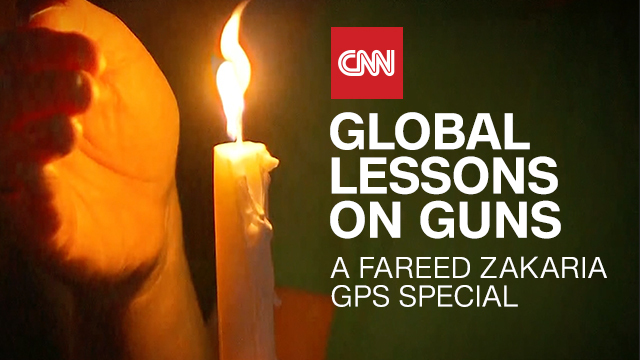 Beginning Monday, Nov. 26, Global Lessons on Guns – A Fareed Zakaria GPS Special, will be available for subscribers on demand via cable and satellite systems, CNNgo platforms, and CNN mobile apps.